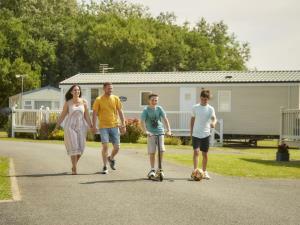 Manor Park - Parkdean Resorts0344 3353754work Holiday & Touring ParkManor Park has all the ingredients for a relaxing holiday. On park you can splash about in our new for 2016 indoor pool, have fun in the play park, or sit back and enjoy exciting family entertainment. Discover the sand and shingle beach a short walk away.
" And so much more! Facilities for children: cots and highchairs available. Manor Park has all the ingredients for a relaxing holiday. On park you can splash about in our new for 2016 indoor pool, have fun in the play park, or sit back and enjoy exciting family entertainment. Discover the sand and shingle beach a short walk away. Take A149 from King's Lynn. On entering Hunstanton turn left on roundabout down Oasis Way. Left at next roundabout for Manor Park. Take bus 410 from King's Lynn station to Hunstanton.